Drop 7 foods; lose 7 pounds; just 7 days. That’s what the book cover said. But actually, I have gone almost 3 months without 7 foods, and I have probably lost far more than 7 pounds. I know I’ve lost inches. 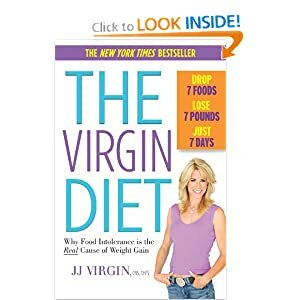 It began around the first part of January when my husband mentioned he’d seen a woman on PBS talking about 7 foods that can cause not only weight gain, but joint pain. Joint pain is my middle name since being diagnosed with Fibromyalgia 26 years ago. Was there a way to decrease that pain simply by changing my diet? It was Soy that caught my attention the most. About a year and a half ago I started AND completed P90X. It was a tough workout, and I worked hard for the prescribed 90 days. But, I didn’t feel that I’d gotten as ripped as I should have with the hours of workout time I’d put in. Interestingly enough, I started drinking Soy milk at about the time I started the P90X workout. Even though I have decreased my workout intensity, I’ve still continued exercising 4-5 days a week, yet I’ve gained belly fat. Could that belly fat be due to the Soy in my diet? Ms. Virgin says yes. She concluded that by dropping Soy and the other 6 foods for 21 days that the immune system could be reset, and that a person would have less pain and actually lose weight. After just 4 days without these foods in my diet I felt great! My Fibromyalgia pain decreased immensely. I was actually coming to grips with the idea that I’d need surgery on my right shoulder because it hurt so badly I thought it must have been injured somehow. But after about a week without these 7 foods, I had no more shoulder pain, and I was no longer taking Ibuprofen every day for my typical Fibromyalgia pain. I was surprised to learn that diet would have such a profound impact on my pain. I have felt no urgent desire to add these foods back into my diet after 3 months without them! Of the 7 items on the above list, only 1 (sugar) was something I’d been taught to avoid. The other foods had always been suggested on the pyramid of food groups. But somewhere in my past I’d developed an intolerance to these seemingly healthy foods. Could this lesson be compare to your business? Are there things in your business that you assume are good, but in fact may be undermining your success? What if you dropped behaviors or actions typical in your business that appear to be good, but are actually causing you unnecessary pain? For instance, do you believe these business best practices? An advertising campaign is necessary to get new customers/patients. Although these are common aspects of a typical business model, they are not always right for your business, always. The world changes every day. We get information from vastly different resources than we did just 15 years ago. If you’re not changing, then you’re falling behind. I was experiencing unexpected weight gain and increased pain because I was doing the same things I’d always done, or had been taught to do. Are you experiencing unwanted pain and consequences because you’re doing what you’ve always done? Think about what you can drop from your current plan that may cause the successful outcomes you’re looking for. Think about what you’ve been doing in your business for so long now, that you don’t even consider doing anything else. Then, consider if it’s really working for you. What have you been doing in your business consistently for at least 1 year? This is the very useful article for one who wants to lose weight. ideas to Drop 7 foods; lose 7 pounds is awesome. Please keep writing these type of useful article.